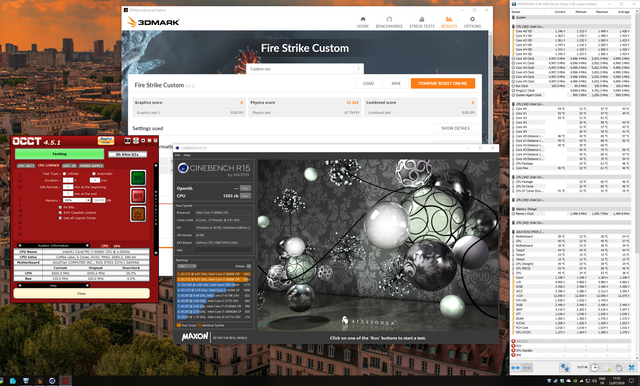 These chips are good overclockers, today the weather is a bit cooler in Paris, 24c ambient and the cpu hits 70c max. 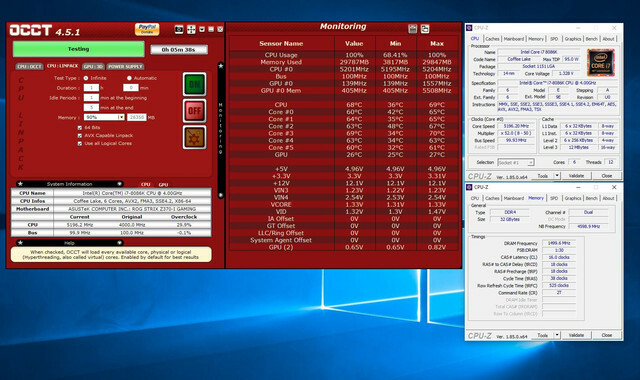 The Z370-I (Bios 1002) from Asus is also working well with LLC @ 6 , CPU voltage is rock solid, no vdroop, no overvoltage. Cooling is a H115i from Corsair in pull configuration fans at fixed 1200rpm. Delid it, takes 5 minutes of your life and the overclocking headroom after is great. Maybe the Corsair H115 AIO is not up to the task, and I don't have other options in my NZXT Manta case.. If everything is stable but one thing and that thing is a synthetic benchmark your probably fine. If everything you do is stable and 99% of your synthetic benchmarks are stable I'd call it a success. Do you plan on using this clock 24/7? seems like you have a golden sample for sure even as far as 8086k goes, but do you want to impact its OC stability with over 1.3v plugged through it so much? I would rather settle for a 5Ghz with lower volts like what you achieved and have longevity. Besides do you even notice a difference between 5 and 5.2 or was it just for synthetic scores? Actually finding the lowest volts for 5ghz was next on my to do list.. Anybody know what the stock intel volts for cpu vccio and cpu system agent are ? Currently have them at 1.23v for VCCIO AND 1.17v for System Agent. Also, i'm not sure how people are putting 1.4v through these chips unless they have some mega cooling setup, my H115i cannnot handle more than 1.35v on this chip. According to 8Pack anything up to 1.425v is completely fine for 24/7 usage with decent cooling on the 8700K and considering the 8086 is just a highly binned 8700K I'd imagine the same would be true for it.